When I was in college, I had a friend named Sam who kept a microphone in the cab of his car. Most people sing in the car, but he took it to the next level–using props. While most people are embarrassed to be caught singing in the car, he added a prop! He never seemed to mind stares from people at stoplights that glanced over and saw him screaming into a microphone. Aside from the added distraction while driving and safety concerns, I think this is great! If only more people cared less about how silly they look and just did what they enjoy. As a creative thinker, I think is important to stop worrying so much about looking foolish, asking dumb, questions, and other activities that one might fear. This is when true creativity will flow and when great ideas will emerge. What a fantastic idea! 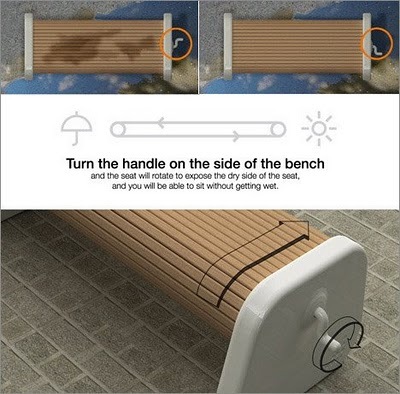 Benches become useless when it has recently rained (which is often here in the northwest). This is a very innovative solution to the problem. Some creative ways people have earned jobs. Alec Brownstein bought Google ad words for a handful of creative directors’ names he wanted to work for so that when they Googled themselves a message from Brownstein was the top result. He now works for one of his targets at Y&R New York. This cost him a mere $6. I recall another example where a person put out ads claiming to pay the expenses of a vacation for anyone that could get him a full-time job (vacation location varied based on the salary of his new job). This recession is certainly a scary time for individuals seeking a new career, but it can also be an exciting time for people to find new creative ways of earning a new career. Have you heard of any creative or bizarre job search stories, or do you have some great ideas of your own? Feel free to share them in the comments. I’ve decided to start blogging, and since I haven’t updated this since I was in college, I think it is time for an update. I moved to Portland Oregon–like a year ago–and I have been working freelance up here. In the year I’ve lived here, I’ve met some great people, enjoyed some great scenery, and done some fun activities. I will be blogging much more in the future, I promise.